Unravel Me will reveal A LOT of things that you just can't believe but it makes a lot of sense if you think about it for a minute. So prepare your emotion because if you are not careful you may breakdown. I knew I did. 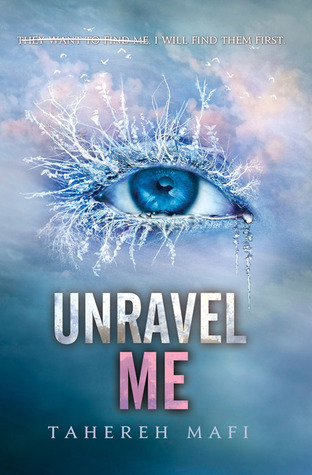 Unravel Me is more intense than Shatter Me because the secrets are revealed. But as the same time I think I've laughed more than the first book because of Kenji. He is such a funny guy and whenever he is around, the air is just...breathable you know. The reason I said that is because there is one person that put me on the edge the whole time. It is Adam. Poor Juliette, she has to deal with this damsel in distress. ♥ "Listen, I don't have a clue what you see in this guy but you should try to living with him. The man is moody as hell." ♥ "I will be waiting for you when you are ready. I'm not going anywhere. There won't be another person for me. You're the only one I've ever wanted and that's never. "he says "that's never going to change." ♥ "I want to be the friend you fall hopelessly in love with. The one you take into your arms and into your bed and into the private bed adn into the private world you keep trapped in your head. I want to be that kind of friend...Yes I do want to be your friend. I want to be your best friend in the entire world." ♥ "Please don't shoot me for this." and he kisses me.